Ways to use essentia… on Are Essential Oils safe? Natural Health Education that makes Scents! Keeping your infant clean and comfortable can be a challenge sometimes! Well, OK, lots of times. If you are a parent of a newborn, you know how challenging a “blow-out” can be! Sometimes you have to bring out the big guns to clean up the mess! Have you thought about what chemicals are in the disposable wipes you are using? And for that matter, are you sure they are leaving your baby’s skin clean and protected? Young Living Seedlings has two wonderful products you are going to fall in love with immediately. 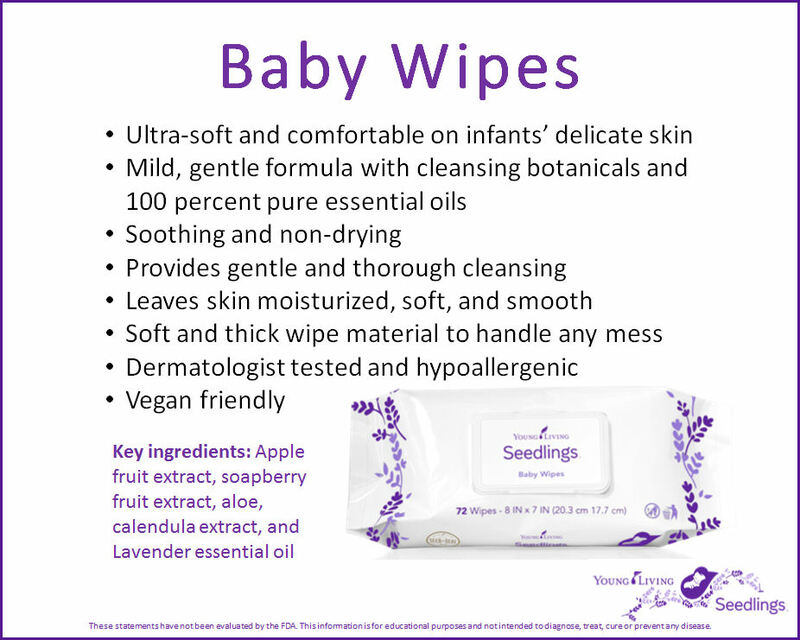 Seedlings Wipes are generously sized for the biggest messes at feeding or diapering time. They smell great and are 100% safe for your baby’s skin. And then there is the Seedings Diaper Rash Cream. It is registered with the FDA as an Over The Counter medication, and does an amazing job at relieving, preventing and treating diaper rash. And on a side note, both these products are great for everyone in the family. I love the Wipes for removing makeup. The Diaper Rash Cream will soothe and protect the most sensitive areas of any body, no matter what age! I do love how versatile Young Living’s products are. Seriously, you really need to get them! I have published a special newsletter called Seedings: From Mother Nature’s Nursery to Yours. If you don’t have a copy of it, please send me an email and request the Seedling newsletter by name! You’ll love all the information it contains and will want to keep it for future reference. If you have questions please contact me at joyce@ShareScents.com. These statements have not been evaluated by the FDA. Information, products and/or techniques mentioned is provided for educational purposes and not intended to diagnose, treat, cure or prevent any disease. Consult with the health professionals of your choice. The decision to use, or not to use, any of this information is the sole responsibility of the reader. The author assumes no responsibility to or liability for any loss, damage or injury resulting from the use or misuse of any information provided here. Can Baby Wipes cause rashes? Baby wipes appear to be the cause of allergic reactions in some children, pediatricians are warning in a new report detailing six recent cases at a Connecticut doctor’s office. The culprit is a preservative called methylisothiazolinone (MI), which is found in personal care and household products. This is the first time MI in wet wipes has been reported to cause the allergic skin rash, called allergic contact dermatitis, in the United States, according to the report’s authors. MI alone has been thought to be less harsh than MCI, and baby wipes generally have been considered to be harmless. The authors, however, said they’ve found six cases of children with chronic reactions caused by baby wipes that were later confirmed by allergy testing, and only resolved once the offending wipes were removed. Doctors initially misdiagnosed some of the children with other skin infections, and mistakenly prescribed antibiotics and steroids. But these patients too saw their symptoms resolve once their parents no longer used the products. They authors urge parents to read the product labels and avoid any products with the chemical if their child has this allergic reaction. Problem areas include the buttocks, mouth area and hands. Parents might even get rashes on their hands if they have an allergy to MI. Here’s the good news! 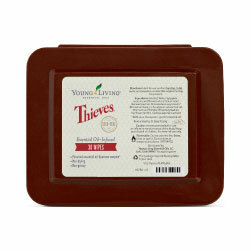 Young Living’s Thieves Wipes do not contain MI or any other harmful chemicals. They are completely natural and safe! You might want to consider Thieves Wipes as a safe alternative to other brands of wipes. And if you or baby develop a rash from time to time, I have found Tender Tush to be amazing! Again 100% safe. And remember, Young Living is a full-disclosure company. To learn more about Young Living products, please visit my website and contact me. These statements have not been evaluated by the FDA. Information, products and/or techniques mentioned is provided for educational purposes and not intended to diagnose, treat, cure or prevent any disease. Consult with the health authorities of your choice. The decision to use, or not to use, any of this information is the sole responsibility of the reader. Don’t expect the same results unless you are using Young Living Therapeutic grade essential oils and supplements. The author assumes no responsibility to or liability for any loss, damage or injury resulting from the use or misuse of any information provided here.